In January this year SAP released the second version of the Travel Accelerator. This article has a purpose of familiarizing the reader with the concept of the Travel Accelerator 2.0, its capabilities and limitations. I think there are few companies with hundreds of specialists in the world who are able to build the custom solutions using Travel Accelerator. Understanding this topic should make this circle of knowledgeable hybris people larger. Certainly, it is not possible to deliver all knowledge and experience I gained during my research in one blog post. All lessons I’ve learned during long hours of debugging and deep examination of the product cannot be explained in all details. However, I hope this article will help you to get the same level of understanding faster than you would do without it. The documentation for TA is not available on hybris wiki [yet?]. There is some documentation that comes with the installation package, however, the documentation from the version 2 explains only the updates of 2.0. The major part of the documentation that was written for the first version has not been included in the second version for some reason. I hope this article will help you to see a big picture and understand how Travel Accelerator works. Everything from this article outlines my personal view on the subject. if you see any discrepancies with your vision and experience, please leave your comments under the article and I will make necessary changes. If you are familiar with the concept of Accelerators in hybris, please skip this part. It is trivial, but necessary for those who are new to the topic. “SAP hybris Accelerators” are reference demo stores that can be also used as a template for new solutions. Some of them come with the hybris, others are supplied as separate products. You are possibly familiar to Electronics, Apparel, Powertools and Telco Accelerators. These products are included in the default installation package of SAP hybris. Unlike some other products with “Accelerator” in their name, Travel Accelerator comes as a separate package. If something doesn’t meet your expectations, you can replace any parts of it with your our implementation. The first version of Travel Accelerator was released in April 2016, a year after SAP had announced the product. The initial name of it was Airline accelerator. In the second version, SAP added online accommodation services. The product became useful for hotels and cruise companies. The second version was released in January 2017. The third version is expected in July 2017. After examining the product, I came to the conclusion that the Travel Accelerator is the most suited for transport companies and hotels. Such markets as airports and tour operators may expect more than the product currently provides. 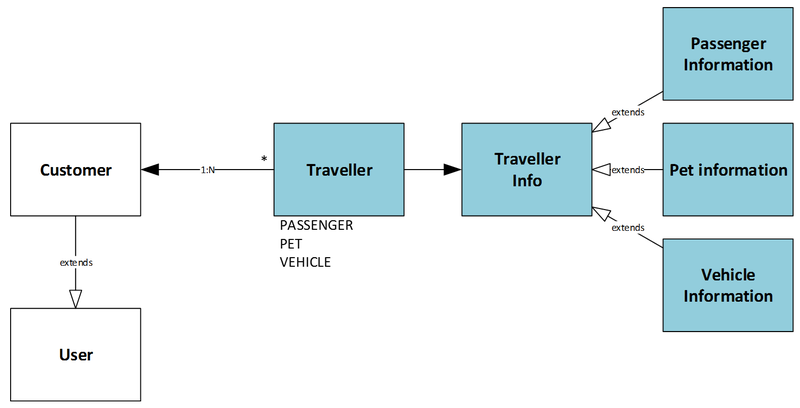 It is assumed in the travel accelerator architecture that all data are in the local database and it costs almost nothing to pull it in different combination and with a required rate. Tour operators and airports can use the external booking services, such as Amadeus or Sabre, rather than direct connection to service providers. The providers like Amadeus or Sabre don’t share raw data with travel companies. They provide APIs to pull the data, every request is not free. Both in terms of money you need to pay to them and resources you need to have for that. Travel Accelerator is not designed to work with the remote data providers. 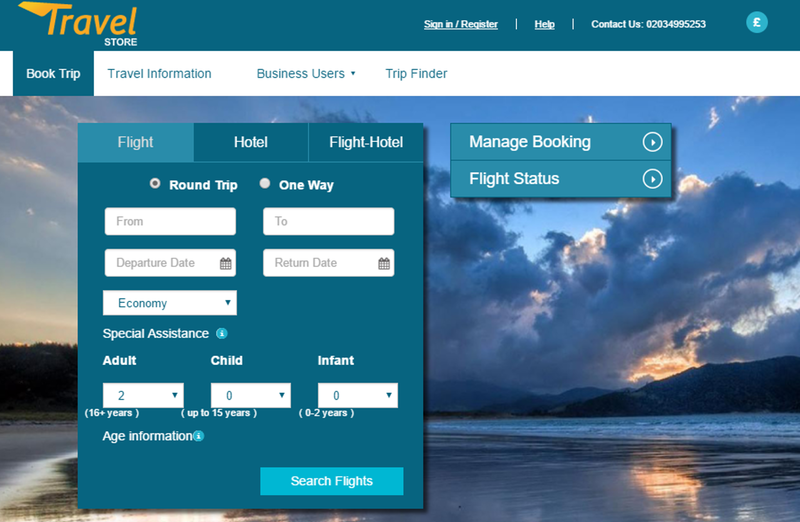 All flight schedule information, as well as all possible routes, segments and prices, are to be loaded into the system for the ticket booking, the same is for accommodation availability data for the hotel booking module. These modules are represented by a set of hybris extensions. Some extensions are common and mandatory for any solution. The screenshot above demonstrates the search form for the ticket booking module. The similar form is used for accommodation booking. These are starting pages for the search and checkout processes which are specific for each module. There are other (minor) starting pages as well. There are other processes of the lesser importance, such as registration, ticket/accommodation amendment, returns, my orders, and B2B. I’ll come back to these points later. Blue boxes represent the flight ticket booking process. Orange boxes represent the accommodation booking process. Green boxes are common for both flows. They also represent the components derived from default hybris accelerator. The starting pages contain the search forms. After any of these forms are submitted, the system shows search results. For ticket booking, these results will contain a list of offers from transport companies. For hotel booking, the results are hotel offers. Travel Accelerator allows you to create packaged offers and bundled products. Ancillary Services are the extras, additional services, things you would need to complete your holiday, apart from booking your hotel and accommodation. They represented as products in Travel Accelerator. The key objects in the Transport module of the Travel Accelerator are routes, sectors and transport offerings. Routes can have one or more sectors – think about it as connected flights. Transport Offerings are flights themselves. This is a representation of a particular schedule for a point to point travel segment. It can represent any transport schedule such as a bus or a cruise. In the default data setup, it represents a flight. Each transport offering also holds information about the availability for booking classes (fare products) and ancillary products. If the itinerary is made by 2 sectors (and therefore transport offerings) hybris will first look up the mapping by travelRoute. If no mapping is available, hybris will perform two different lookups (one per sector) and combine these two options. Data setup in the travel accelerator is made so that each multi-sector route has its own mapping. After you complete the fare search form, the system displays a list of offers that meet the criteria. Internally, this process is very interesting. There are a number of sequential steps. Each step enriches the data from the input and pushes the updated object through the pipe to a next step. There is an interesting point. Fare basis rules govern how and when fares can be used. These rules are evaluated using Drools rules engine. This step is executed every time you perform a search. The system discards a fare product if business rules are not met. Second example. The number of days between ticket dates should be less than 4 days in order to call the trip “a minimum duration stay.” Some fares require you to stay in your destination a certain amount of time. 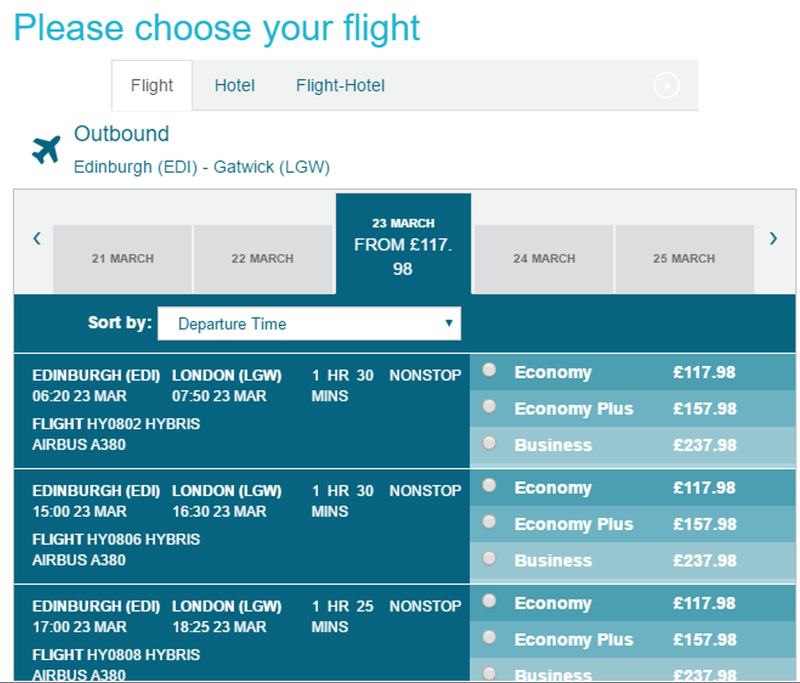 So, if you try to find flights from Edinburgh to London in the default setup, the Drools Engine will be called 71 times and SOLR will be called 4 times for a single user and single booking request. In the out-of-the-box Electronics Accelerator, the Drools engine is called only once per a shopping cart state. Another interesting point with this flow, that the SOLR request doesn’t have any limitation on the number of records from SOLR. This ‘rows‘ parameter is used to paginate results from a query. It specifies the maximum number of documents from the complete result set to return to the client for the request. The TransportOffering is a huge list of schedule items. And this request is performed four times in a row per one mentioned customer request (EDI->LGW, a round trip). 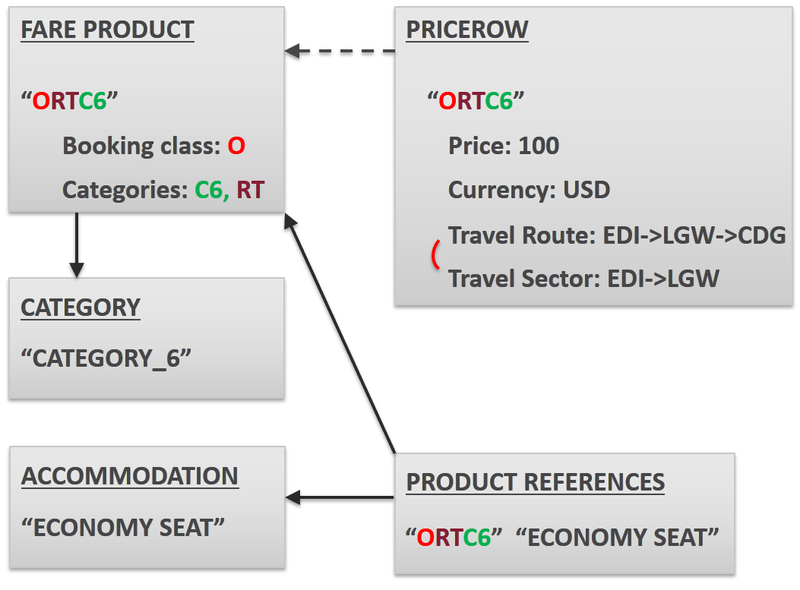 Fares can be of different types, like fees or ancillary products. Room rates will be explained later in the Accommodation section. 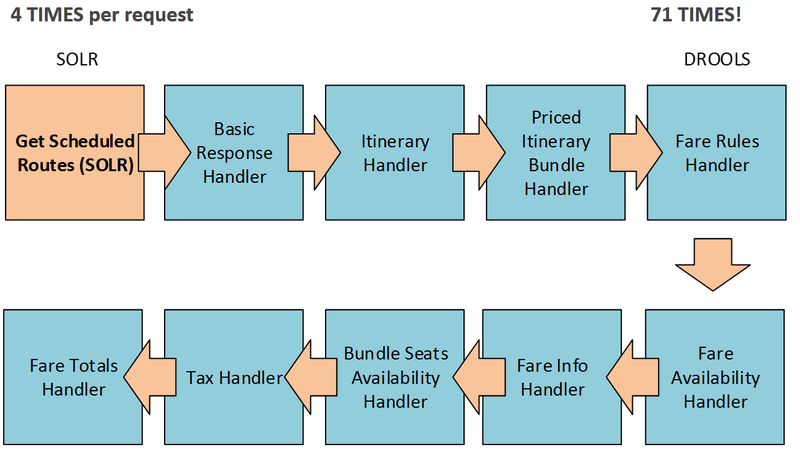 TravelAccelerator implements handling of fare basis rules taking inspiration from ATPCO fare rules. Booking class “O” (along with some other letters) means “economy fare”. OW stands for “one-way”. RT means “return fare”. CAT 6 stands for Minimum Stay. All together represent a fare. 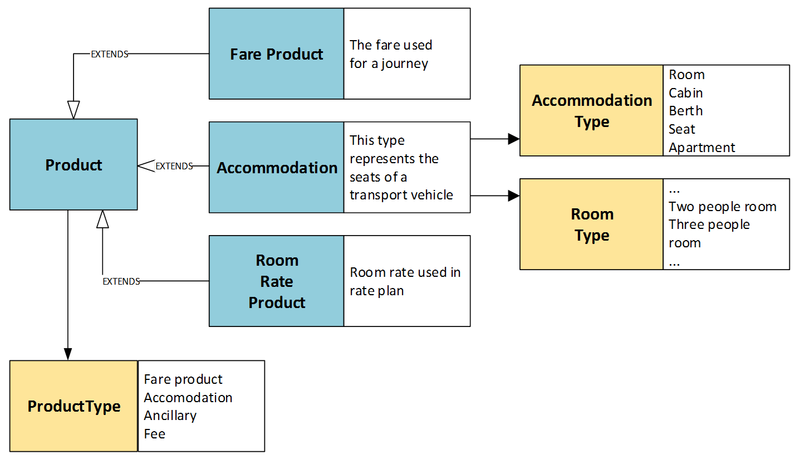 The fare products are grouped by accommodation level, economy or business seats. Availability. The plane has a limited number of seats of different price groups. These price groups are represented by fare products, and availability is represented by hybris StockLevel. In the default hybris stocklevel should refer to the warehouse. In Travel Accelerator the warehouse is TransportOffering, a schedule. The diagram shows, that there are 200 seats of the price/ticket group ORTC6 available for the flight 1400 scheduled for 23.10.2017 10am-2pm. The particular vehicle type is represented by ConfiguredAccomodation object. You can describe a seatmap via tree-like structure AirCraft->Deck->Cabin->Row->Seat. Don’t be confused with Accommodation item. These terms are not the same. Accommodation is a product and therefore may have a price and some features. ConfiguredAccommodation instead, represents a particular room, a particular seat. It can be assigned to a ticket but it is not involved in the reservation process. ConfiguredAccomodation is a particular form of accommodation that is part of an so called accommodation map. Accomodation map has a self-explanatory name. For aircrafts that is a map of the plane. It is associated with a specific Transport Offering. Travel Accelerator introduces a new object, Traveler. One order can have a customer (who pays) and travelers. Travelers are used to represent passengers, pets, and vehicles. Order Entries refer to products of different types (see Products section). The accommodation module was introduced in Travel Accelerator 2.0. Starting version 2 the Travel Accelerator can be used for online booking for a hospitality sector, including lodging, event planning, theme parks and so on. A rate plan is a concept that is similar to a Fare Product in the previous section. It characterizes the group of rooms, not the particular rooms. These plans can be applied to a number of hotels. In the demo store there is a naming convention for rate plan names: a number of stars, max persons, rate plan restrictions, and rate plan country. A ratePlan can also be put into a relation with Guarantees and Cancel Penalties. A Guarantee can be a fixed or percentage amount of the total accommodation price. A CancelPenalty is a fixed or percentage amount of the total accommodation price that is withheld when cancelling the booking. It can also depend on when the cancellation is done. A ratePlan can also have some rate plan inclusions. These are the services included in the rate plan with no extra cost. For example, free parking. Room rate products are the products associated with the stay in a specific accommodation in a specific date. In the demo store there is a naming convention for room rate products similar to one for rate plans. The naming convention for room rate products includes the hotel name, because unlike rate plans this object describes the specific room groups in the hotel. The roomRateProducts are linked with the corresponding RatePlan via the product / category relation. The prices are associated with RoomRateProducts. Price row says that the particular room group in the hotel has a particular price. StockLevels shows how many room rate products are available in the hotel. Hotels in this module are managed like warehouses in the default accelerator. Each hotel has a hotel products, room rate products. These products have a stock value that shows how many rooms are available for booking. StockLevel can be defined not only for RoomRateProduct, but also for Accommodation (for example, “Single rooms”). The system finds a minimum when requested for availability. This minimum quantity between the stock level for a specific day in accommodation and room rate plan is selected to be shown to the customer as ‘X rooms available’ on Accommodation Details Page. The system calculates the availability for the requested period of time, day by day. When a user starts a booking and lands on the Payment Details Page the Travel Accelerator will provide up to two different payment options. A Payment Option is a high-level concept basically representing the possibility to pay a certain amount at a certain moment in time. The travel Accelerator comes up with two built-in payment options, each one with its own set of rules to be qualified as permitted. In the first case, the whole amount has to be paid at booking time. The opportunity to pay the whole amount in advance is always provided. Directly at the moment of booking, via Payment Details Page, or after placing the booking, via Booking Details Page. The second option is more interesting. It is an opportunity to pay part of the booking in a certain moment in time, after placing the order, is provided only under certain circumstances. Transportation-only journey as always paid in advance. Accommodation part is more flexible. That is because I put payment related information in the Accommodation section of this article. For this option, at least one of the rate plans associated with the accommodations (that are going to be reserved) must be linked to a Guarantee. A guarantee is a payment as assurance that the full payment will shortly occur and it’s a typical concept in an accommodation context. travel aggregators, especially if they are not directly linked to service providers’ data, and the raw availability data is not accessible. The version 2 comes with two modules, “ticket booking” and “accommodation”. Accommodation is a brand-new module in version 2. There is a risk that the system will work too slow for a large amount of data. You need to weigh all factors and risks before going to a large project with a huge schedule and non-trivial logic. At least the performance tests should be carefully conducted. Drools engine can be a possible bottleneck. For very large schedule SOLR can be a bottleneck too. The data model is well designed. The modules are very good internally and well organized. For budget airlines, small hotels and motels this product seems very suitable. Businesses will be able to achieve a rapid time to market. B2B capabilities of hybris are organically integrated. After releasing the 2nd part of the Travel Accelerator, many companies were capable to build the custom solutions using this. With their capacity and limitations. The transport companies and hotels are very much helped by this, some markets like airports and tour operators may expect more than the product now offers. May I ask what sample data, locations and hotels are included in the default installation package? hi Rauf, very good analysis and thank you for the report. Quick question for a travel agency (selling tickets for different airlines, hotel room, other services like visa/insurance…) is the solution suitable? what are the limitation of the Hybris travel and are there ways to overcome them? The solution is great if your requirements and expectations match the core capabilities of the product, at least 50%. If so, you will save a lot of time and money going with travel accelerator rather than creating it from scratch. And it will work for a travel agency (connected with multiple GDS and Hotels) business? You need to download it from SAP downloads as a separate package. SAP promised to release version 3.0 in June/July, but it seems something went wrong. Version 2.0 (Jan 17) is available for download.